Working for months on a project – especially in a virtual world, where one does much of the work alone even if in a team, and where one’s own “creations” sometimes become sacrosanct – you often get to a stage where you can’t see the wood for the trees as self-criticism and objective analysis take a holiday. The result is that the objectives of a project are sometimes lost or buried and you believe the emperor is clothed when in fact he is only partially clad, or his clothing is unfinished. 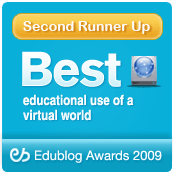 In a virtual world education setting this can mean the student misses out or has difficulties learning and the tutor-facilitator is left frustrated and wondering why the lesson did not work and learning objectives were not filled. To avoid these problems the SLENZ Project recently commissioned John Green (pictured right), an expert in online learning and senior lecturer in information sciences with the School of Information and Social Sciences, at the Lower Hutt-based Open Polytechnic New Zealand, to walk-through the SLENZ Project’s Foundation Learning and Midwifery pilot builds and programmes on the island of Kowhai in Second Life. Teaching since 1981 and online since 1999, Green has presented details of his research in online learning in the UK, US, Canada, Mexico, Thailand, Australia and New Zealand. He also has taught other teachers to teach online at other institutions and advised international universities regarding eLearning. His walk-through of the two builds, Foundation Learning, being led by Merle Lemon (SL: Briarmelle Quintessa) of Manukau Institute of Technology, and Midwifery, being led by Sarah Stewart (SL: Petal Stransky), of Otago Polytechnic, although not critical of the programmes as a whole, resulted in a number of recommendations for changes to various facets of the builds and programmes. “John Green’s walk-through was extremely useful and provoked thoughtful discussion among the team members,” the joint project leader, Dr Clare Atkins (SL: Arwenna Stardust), said. “He gave us an independent opinion on how we might enhance both the builds, which encouraged us to articulate why we had done things in certain ways, and, of course, pointed out things that needed correcting. “This was another layer of the process which allows us to make changes and enhancements to improve the student experience,” she said. Green recommended five “top critical changes” for each programme. 1. Purposeful activities must match clear objectives. 2. Students should understand questions before going in world so that their observations can be more focused. 3. There are not enough clickable objects to be consistent with with the richness of the requirements of the activities. 4. Student reporting should be centralised for the sake of both student and teacher. 5. Some of the writing and multimedia appears to be more affectation than instructive. 1. Lack of sound/predominant “motorway noise” type sound (ed note: ambient wind sound?) is very disturbing. 2.Video does not work for me. 3. Blue for go on buttons is not intuitive on Hyperdome Console. 4. The adoption of correct body language, voice tone and eye contact in Activity 4 is best done by videoing a real life role play since the SL interface is not good enough to provide this successfully. These may well be played back in SL if needs be for student comment but I think it is best for this final stage to be “real”. 5. Welcome notecard is not about the students; it is for marketing SLENZ and should be removed/moved elsewhere.